This rain won't clean your car off! We've received several reports from social media this morning of sprinkles on cars and other outdoor objects that leave behind a residue, or dust, after evaporating. 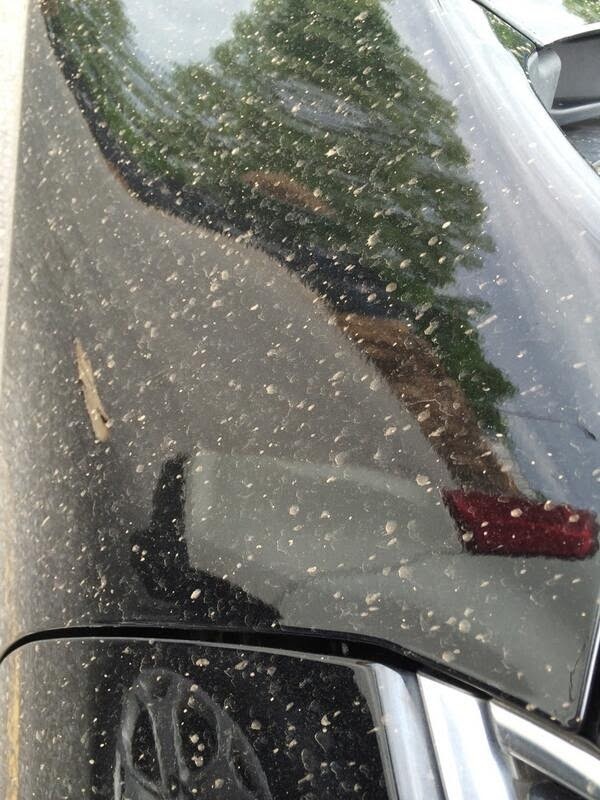 In fact, I had noticed the same thing on my windshield yesterday and assumed pollen, but didn't look closely. The pictures received though we definitely NOT pollen. It was dirt. A couple of thoughts immediately came to mind. First (and this one seemed less plausible than the second) was dust/dirt from Arkansas that was sucked up by tornadoes on Sunday and deposited downstream. I had heard of such a thing happening, but the timing (2 days later) and wind patterns didn't quite make sense. The second option was dust from the plains carried east on upper level winds. Knowing there was a massive trough over the middle of the country and a strong jet stream blowing from west to east across our area, I knew that option was more plausible. Sure enough, after a little digging and checking in with the NWS to get their opinion, I'm fairly confident that it is indeed dust from the plains. 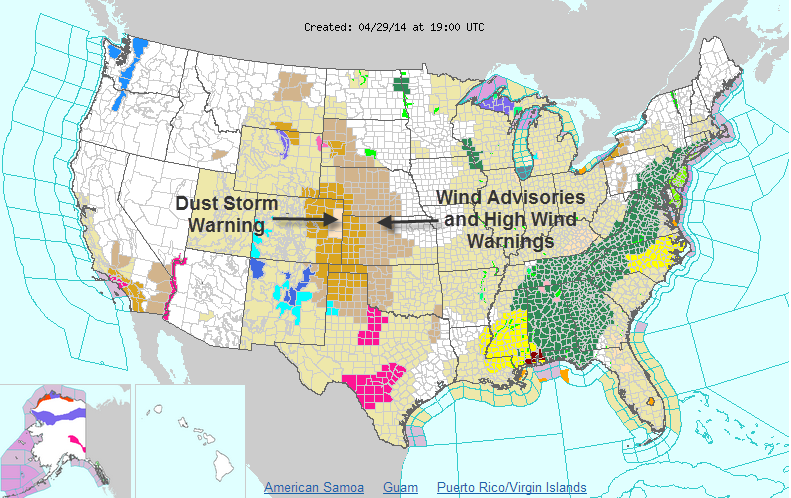 For the past few days, strong and gusty north wind has prompted dust storms across the central and southern plains. In fact, the NWS watch/warning map below shows Wind Advisories and High Wind/Dust Storm Warnings in effect right now across the plains. Then, I got a text from a family member who happens to be on the interstate in the TX panhandle describing vicious wind and "raining mud!" Sure enough, dust storms were in progress and light rain was dropping the dirt back to earth! Dust storms are known to eject fine dust particles thousands of feet into the air where they are carried by the currents downstream. Below is the current upper level (about 35,000') jet stream courtesy of an awesome animated web tool called the "Wind Map." 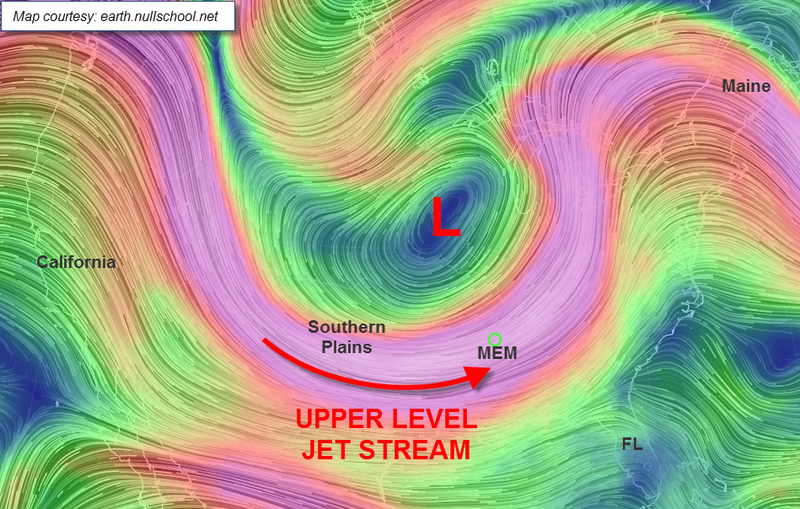 The large L is the low pressure trough that the jetstream wind is flowing around. Key points are labelled. So you can see that as the dust is picked up and ejected into the upper levels of the atmosphere, it gets carried downstream and deposited or rained out of the atmosphere! The light rain falling this afternoon is not going to be good at washing pollen off your car, but instead could result in a trip to the car wash thanks to strong wind and plains dust that is transported all the way to Tennessee! A Tornado Watch has been issued for the western half of west TN and all of northeast AR and southeast MO until 2am (see map below). 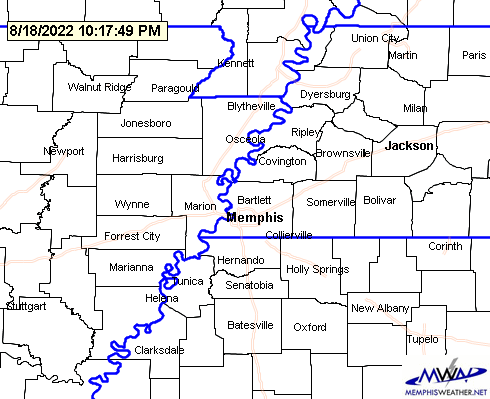 Meanwhile, the watch for north MS has been cancelled. Based on latest high-resolution model data, I'm not convinced that we won't see more watches that take us through the night as a couple of rounds of storms are possible. Everything is quiet in the metro for now, but the storms in AR have produced damage, some of it devastating northwest of Little Rock. The good news is their environment is much more volatile than ours is or is predicted to be. However, we will actually become more unstable overnight than we are now as the warm front we've talked about all day finally moves to our north and puts us in the warm sector of the approaching front. Based on all the latest data and discussions from the experts, I look for additional storms to move into the metro somewhere in the midnight-3am timeframe, give or take an hour either way. Then a squall line looks to move in around sunrise, perhaps affecting the Monday morning commute. The main risk overnight will be large hail (garage your vehicles if you are able or pull them under a carport) with a risk of tornadoes as well. The graphic below paints those risks well. Overnight severe weather risk area shows a Slight Risk for the metro with the most serious weather in AR, weakening some as it moves east. The probability of a tornado within 25 miles is 10% tonight (definitely worth taking note of, but not nearly as high as AR) and the hail probability is 30%. I can't stress enough that you NEED a way to be woken up tonight if a tornado or severe thunderstorm is headed for your home or wherever you'll be. We hope and pray we don't need them, but we prepare just in case. If you don't have a weather radio, get an app that you can program with your location and alerts only for that location. StormWatch+ is used by thousands of people across the country. Yes, we developed it. I'm proud of it and wouldn't recommend it if I didn't use it myself, and I do. To be sure that you get the full utility from it though, read this about how to set your phone audio overnight to be sure you get warnings. Set shoes by your bed and the kids' beds in case you have to get up tonight (helmets also a great idea for the kids). Flashlights with fresh batteries should be accessible. Check your weather radio for fresh batteries and make sure your safe place is ready. Have pets inside and within your control. The first found of storms has lifted north of the metro with the warm front creeping closer to the area from the south. Scattered storms are forming in north MS, near where a special atmospheric sounding was launched by the Mississippi State University Mobile Sounding Team. The sounding from Helena, AR at 4:30pm showed strong instability and high levels of low-level wind shear, both necessary ingredients for storms that can produce tornadoes. About the same time as that data was coming back, the Storm Prediction Center issued a Tornado Watch for north MS, including all of our metro counties (DeSoto, Marshall, Tunica, Tate), until 11pm (yellow counties in the map above). Currently, a rotating supercell over NW MS has prompted Tornado Warnings and is headed northeast (see radar above). 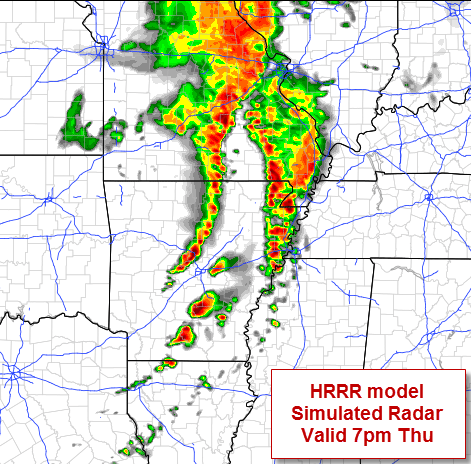 High-resolution model data is indicating that big-time storms over SW MO into AR will shift east this evening and move into the area late tonight, likely after midnight. We expect some weakening as they do, but a weakened rotating supercell could still be a strong storm capable of just about anything. We expect the main brunt of the storms to impact the metro after 10pm and could last much of the night. The same models show a potential line/mesoscale convective system brushing by to the north in the wee hours of the morning and maybe another around dawn. In other words, it could be a long night. 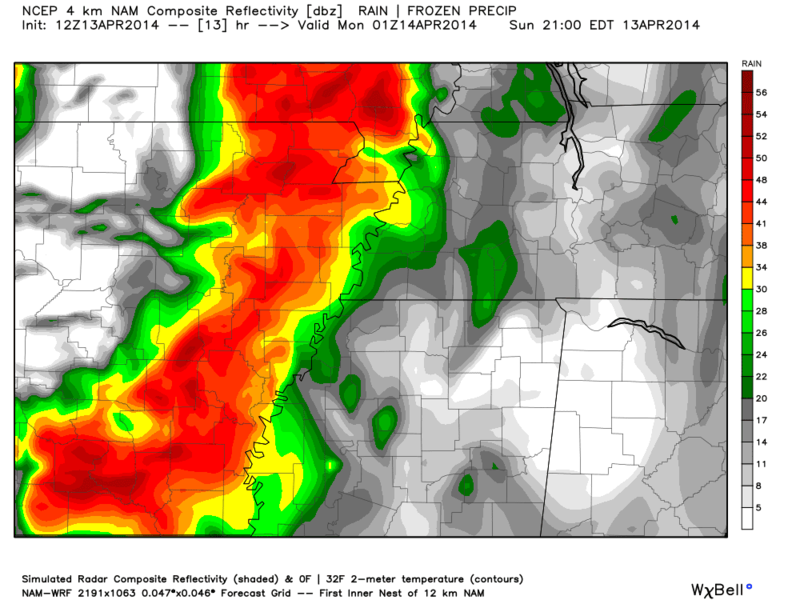 HRRR (high-res) modeled "future radar" valid at 3am with a line of storms from Memphis north. THIS IS A MODEL, NOT A FORECAST. Additional storms are not shown before and after this time. We're hopeful these storms aren't severe, but we caution you to be prepared in case. Before you go to bed tonight, have your weather radio programmed and with fresh backup batteries and your smartphone w/ the MWN app with StormWatch+ programmed and NOT on silent, vibrate, or Do Not Disturb. The severe weather tips below are also good to review. It would be a great idea to have kids' shoes and helmets next to their beds or close by tonight and have your shoes, cell phone, photo ID, and flashlight by your bed. Your safe place should be prepared with the other items listed below before retiring for the night. This may become somewhat of a live blog with updates appended as we go through the afternoon and evening hours, as necessary. But for now, we'll recap the current scenario and what we expect the rest of the day and night. Rain moved in this morning as a warm front moved to a position just south of the metro and has now stalled on our southern counties in north MS producing thunderstorms with torrential rain. A scenario of "back-building" has resulted in which new storms form on the front and move away to the northeast, only to have additional storms re-fire on the boundary and repeat the process. Flash Flood Warnings are in effect for most of NW MS, southern Shelby County, and Crittenden County south of Marion this afternoon and a Flash Flood Watch is in effect for the entire metro until Tuesday evening (see watch/warning map above). Flooding will be a concern anywhere that heavy rain falls for a period of time. Do NOT drive across water-covered roadways. It doesn't take much swiftly-moving water for you to lose control and end up in a ditch that you may not be able to escape from. In fact, the Weather Prediction Center has just issued a discussion that warns of the possibility of severe, perhaps life-threatening, flash flooding across our area. Until the warm front moves north of us, which we expect to occur slowly over the course of the afternoon, additional showers and t'storms will be likely. The good news is that the main threats with these storms will be lightning, very heavy rain and flooding, and possibly some small hail. No tornadoes or damaging wind are expected with this current batch. The other good news is that the rain is helping to stabilize the atmosphere somewhat (for now). Once the warm front moves north, however, more unstable air arrives as south wind becomes gusty and dewpoints rise to the upper 60s - more than enough juice to fuel severe storms. A break in the rain SHOULD occur behind the daytime band of storms and before another round overnight. Most likely this will be in the evening hours. As the dryline/cold front moves into Arkansas today, it will fuel supercells capable of all modes of severe weather, including large and violent tornadoes. We have some concern for the state of AR ito southern MO... These storms will move east into the metro region overnight. We're hopeful that today's rain means a less volatile atmosphere as they move east, causing them to weaken. 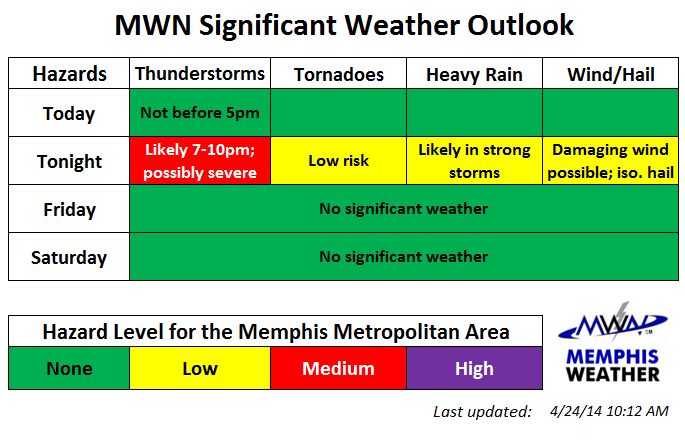 SPC seems to agree that that may be the case, trimming it's Moderate Risk such that the metro is now in "just"' a Slight Risk (see graphic above). I quoted "just" because it does NOT mean the severe weather threat is gone. There is nothing magic about the edge of a moderate risk zone being moved 50 miles. The risk simply tapers some from west to east (AR into TN/MS). We're close enough that overnight storms, which may be after 10pm into the wee hours Monday, can still produce large hail, damaging wind, and a few tornadoes.We'll root for weakening storms, but realistically have to plan for severe ones and you should too. So what is your severe weather safety plan for the overnight hours and have your communicated it to/with family? How will you get severe weather notifications overnight if you need to take shelter? We of course recommend StormWatch+ in the MWN app. It can be set to receive just the warnings you want for the location(s) you want and will wake you up for Tornado and Severe Thunderstorm Warnings. (Read this caveat regarding silencing your device and whether you'll still get our warnings.) 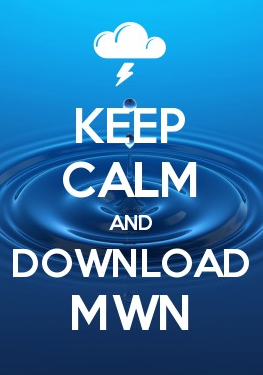 Click here for more info and download links for MWN with StormWatch+. I've said it before but there are two things NOT to count on when it comes to life-or-death warning information: outdoor sirens and Facebook. 1) Sirens likely will not be heard in a closed-up home with rain pouring and wind whipping in a storm while you're sleeping. 2) Facebook does too much filtering of posts and won't show you the one you really needed to see. We're even seeing reports of Facebook not delivering notifications from our page in some cases. Boo Facebook! We'll be posting there, but you may not see it. For tomorrow: the primary threat (Moderate Risk) has been shifted just east of the metro. But re-read what I said above about the delineation between Moderate and Slight Risk zones. We are still looking at a threat of all modes of severe weather again tomorrow, mainly during peak heating into the evening. We'll tackle that more later, but don't let your guard down. A multi-day severe weather event remains on track and appears likely at this time. 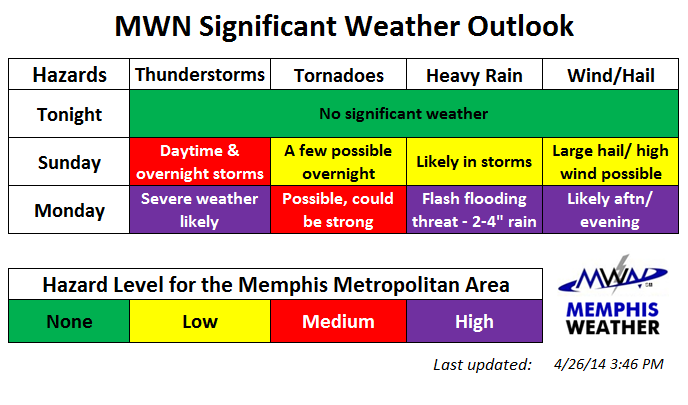 If you read the blog yesterday and follow us on social media, you are aware that the Mid-South and Lower Mississippi Valley are facing what could be the most significant severe weather event(s) since spring 2011. (NOTE that I am not comparing this to April/May 2011, just saying that we haven't seen anything like this SINCE then). I'll handle this day-by-day in an effort to be coherent and for you to glean the most information, bypassing the nitty-gritty details of the state of the atmosphere to focus on threats and possible timing. At a high-level, the main setup is a developing upper level low of huge proportions setting up over the Plains and moving ever-so-slowly east into the Ohio River Valley the next few days, strong jet stream wind and screaming mid-level wind enhancing storm intensity, and abundant of moisture and instability (especially during peak heating) creating the environment capable of producing severe weather. The day starts quiet, but becomes stormy pretty quickly - probably by late morning - as the first area of lift associated with an upper-level disturbance brings in enough instability to create thunder. This round may last into mid-afternoon and will probably NOT be severe, but it primes the pump. Main risks: lightning, gusty wind. A break will probably occur during the late afternoon/evening hours as storms explode over a Moderate Risk area in southwest MO, west AR, and the ArkLaTex. This area could be upgraded to a High Risk tomorrow. During the evening these storms, which will be capable of strong tornadoes, large hail, and high wind, move east and may coalesce into a squall line or MCS (mesoscale convective system) as they move towards the metro. We expect these storms during the overnight hours Sunday into Monday - perhaps late overnight (after midnight). The Moderate Risk currently extends to just west of the metro; we are in a Slight Risk. Some weakening is expected as they move into our area due to less heating from the sun and more organized line(s) rather than individual supercells, but they definitely still bear watching. Main risks: damaging wind, large hail, isolated tornado, heavy rain, copious lightning. 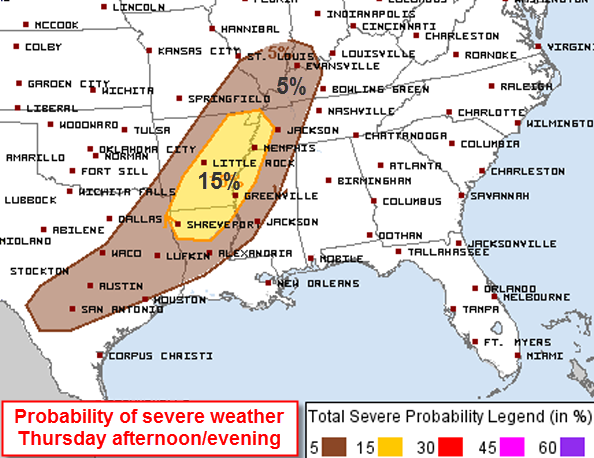 The probability of severe storms in the metro Sunday/Sunday night is 30% according to SPC (see below), with a 45% area just to our west and a 10% risk of significant severe weather (EF-2 tornadoes, 2" hail, 75 mph wind), thus the hatched area in the graphic. Monday is the day of biggest concern, particularly areas along and east of the Mississippi River, which includes the entire metro. Once overnight storms move out, another break is expected in the morning, which (with some sun) will recharge the atmosphere. The impressive (or awful if you hate severe weather) dynamics of the atmosphere shift slightly east and are expected to be overhead the Mid-South. A Moderate Risk of severe weather exists along/east of the river, including the metro. By afternoon, perhaps early in the afternoon depending on morning heating, storms will begin firing right over our area. 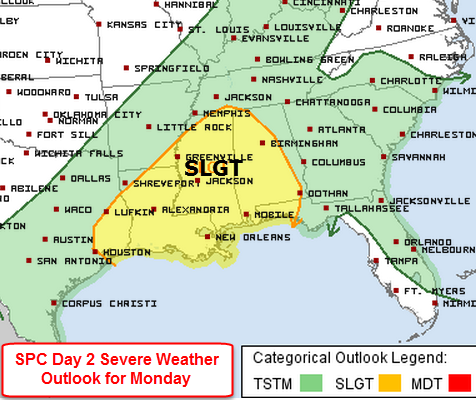 As opposed to Sunday night when storms will probably be more linear, Monday's storms will likely be dangerous supercells, capable of large hail, high straight-line wind, and perhaps strong tornadoes. 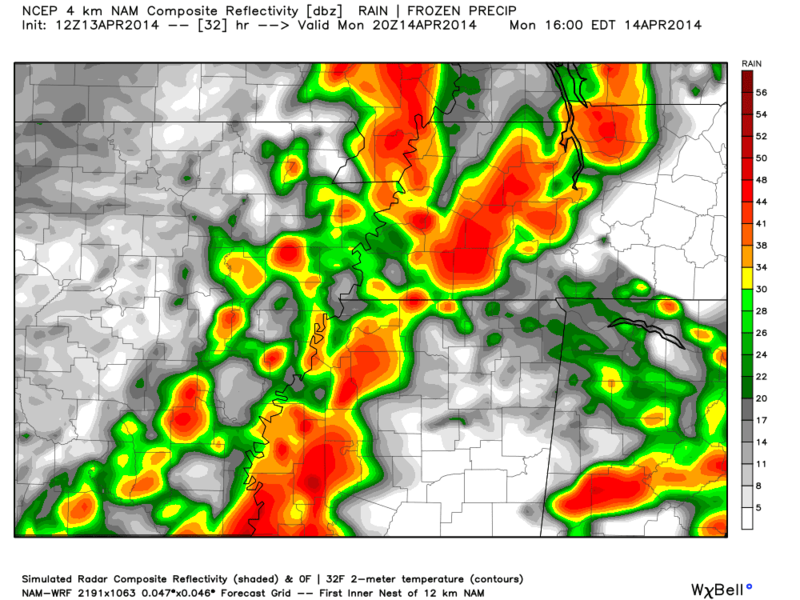 These storms are most likely Monday afternoon and evening, probably ending by midnight. 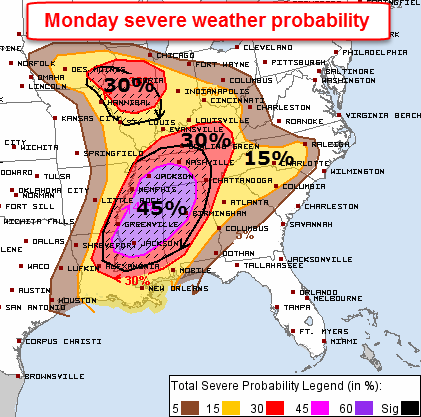 According to SPC, the severe weather probabilities Monday are 45% for severe weather and 10%+ for significant severe (EF-2 tornadoes, 2" hail, 75 mph wind). These probabilities could change. Anything much higher than this and a rare High Risk zone would be required. The potential limiting factor is overnight storms the previous night. If they linger into Monday morning and cloud cover sticks around, the threat could shift just to our east a bit. For now, we're in the Moderate Risk. The risk on Tuesday appears to be lower than thought yesterday. It now appears that the main risk of severe weather will be to our east, more towards middle TN and AL, though a few showers or storms are possible Tuesday morning. The threat on this day is fairly uncertain though and will need to be updated as time gets closer. If the cold front that ends all of the severe weather threats comes through early Tuesday, we'll be fine. If it is delayed into the afternoon and more heating can occur, we'll be more at risk. A Flash Flood Watch has been issued from 7pm Sunday to 7pm Tuesday for the metro. Multiple rounds of storms, each capable of producing heavy rain, could compound issues related to excess water. Sunday starts with ground and streams fairly dry and capable of taking on some water. By Monday though, any downpours could cause flooding concerns. The Weather Prediction Center's graphic below for projected total rainfall through Tuesday morning shows widespread 2-4" rainfall totals and places that see several storms pass over in that period could see 4-6". Being that this is the best chance of widespread severe weather we have seen in a few years, brushing up on severe weather safety is a necessity. See the graphic below for our suggestions, including what a safety kit should include. Always understand your risk and know what you will do no matter where you are during the period of potential severe weather. Plan it ahead of time. Have multiple ways of receiving warnings. Don't count on sirens, especially if you typically have trouble hearing them indoors at your home/work. We highly encourage the use of smartphone apps as one of your "layers" of information. Of course, we highly recommend ours because we built it for you! Get more info on it's capabilities and then download it here. In the MWN app, the most important thing you can do is purchase (one-time) StormWatch+ severe weather notifications. Program your location(s) and then leave it next to the bed overnight unsilenced. It WILL wake you up if a Severe T'storm or Tornado Warning activates while you are sleeping, but only if your programmed location(s) are in the warning polygon. For 1/3 the price of a Weather Radio (which we also recommend but isn't as precise), it could save your life and it definitely provides peace of mind. Finally, we will bring your the absolute latest info, including nowcasting live during storms (without interrupting your favorite TV program) on Facebook and Twitter. We've talked about the issues with Facebook not showing you everything before. We aren't responsible if you miss something - it's best to go to directly to our FB page and refresh regularly or click "Get Notifications" on the Like button on our page if you want to see everything. As always - be prepared, not scared. Though the risk is elevated, the chances of a tornado hitting your house, even in an outbreak, are small. With proper preparation, heeding all warnings appropriately, and taking cover if necessary, chances are you'll be in good shape. A couple of hours of rain and storms and very few warnings were all that came of last night's severe weather risk and Thunderstorm Watch, but at least everything outdoors got a good pollen-washing! 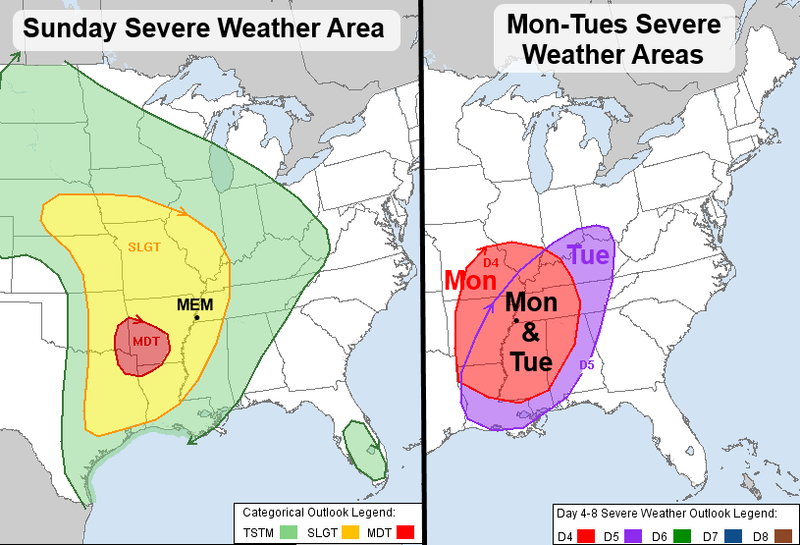 All attention now turns to what may be a significant multi-day severe weather outbreak that begins in the Plains tomorrow, but then threatens the Mid-South and Mississippi Valley into the Southeast Sunday through Tuesday. The map below identifies the areas that the Storm Prediction Center believes, at this time, are worth monitoring and could potentially see an outbreak of severe storms. The left panel shows the severe weather risk area for Sunday. The Memphis metro is in a Slight Risk with the greatest threat from far eastern TX/OK into AR. Models are indicating storms will break out to our west during the day Sunday and move east towards the Mid-South, arriving sometime during the afternoon or evening. The highest risk of large hail, damaging wind, and tornadoes will be west of the river, but the metro will be in a favorable area for severe weather, which could include any mode - hail, wind, or tornadoes, as well as heavy rain and lightning - and last into at least the first half of the night. The right panel above shows the risk area for Monday (red) and Tuesday (purple) with a large overlapping area for both days, including the Mid-South. Monday is our day of chief concern when the severe weather risk is centered over the region. Again, afternoon and evening are when the instability provided by the sun's warmth will be maximized, so the strongest storms would be most likely during those hours, however storms could be possible anytime from morning into the overnight. Until we get closer, timing storms is nearly impossible. Once again, all threats are possible, including large hail, high wind, and tornadoes. In addition, flash flooding could become a threat Monday as well due to the multiple rounds of storms. By Tuesday (purple in the right panel above), the slow moving upper level system will push a bit further east and the actual cold front that will bring the severe weather threat to an end will move through. There is considerable uncertainty five days out as to when that happens. Until it does, more storms will be likely, especially during peak heating hours. We believe that threat is maximized east of the Mississippi River in TN, MS, and AL, but depending on the progress of the front, the west side of the threat area is hard to define. For now, SPC has the entire Mid-South outlooked for possible severe storms. It's a beautiful day today and Saturday will be warmer and more humid but still a very nice day. Don't wait until Sunday to prepare for the likelihood of severe weather. Get your severe weather supplies/kits ready before Sunday. Know where your severe weather shelter will be wherever you will be Sunday through Tuesday. Check the batteries in your flashlights and weather radios and get StormWatch+ in your MWN mobile app set up ahead of time. (Don't have MWN with StormWatch+ for severe weather notifications that will wake you up if necessary? Get it here.) 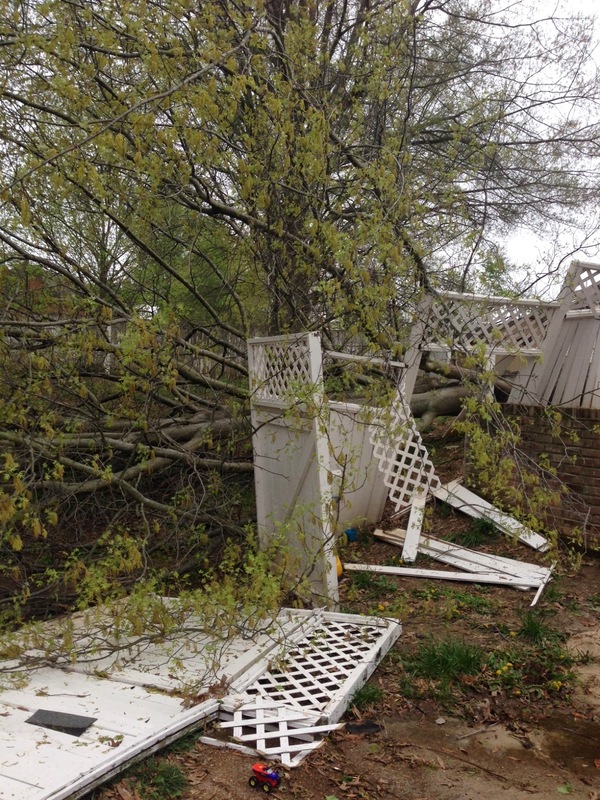 Secure any outdoor items you don't want damaged by wind or hail. In sum, take the time on good weather days to prepare for the bad! This is not written to hype the event or preach doom and gloom, but we honestly haven't seen the threat of severe weather over multiple days in a couple of years (since the awful spring of 2011) in this area of the country. I'm not saying this is another April 2011 event, but overall, severe weather has been fairly benign for with a few exceptions since then. Keep it here for more updates as we get further information and follow us on social media for the latest as well. A potent upper-level disturbance and trailing cold front will move into the Mid-South this evening as conditions becoming increasing unstable this afternoon on gusty south wind. 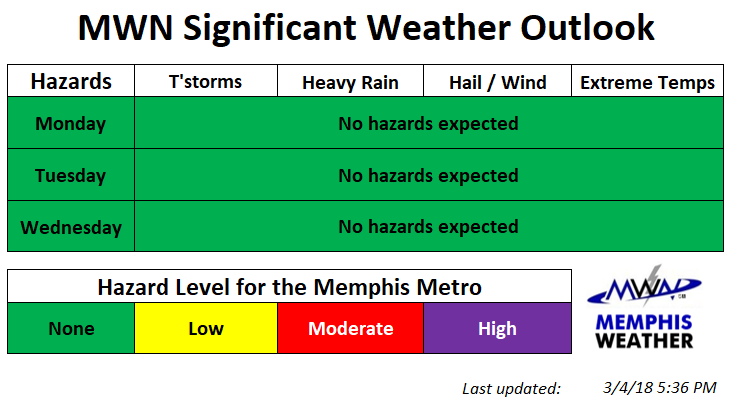 The Storm Prediction Center has placed the Memphis metro in the center of a Slight Risk area with the main threat being damaging thunderstorm wind gusts and a secondary threat of large hail or a possible tornado. According to SPC, there is a 30% probability of wind 60 mph or greater, a 15% chance of 1" hail, and a 5% risk of a tornado in the metro (see graphic below). The expected timing for the storms is between 6-10pm for the metro, or just before and during the Grizzlies-Thunder playoff game. Unfortunately it appears the Thunder are bringing their Oklahoma City storms with them! Most storms should be moving east of the metro by 10pm so there is little risk of severe weather after that time. 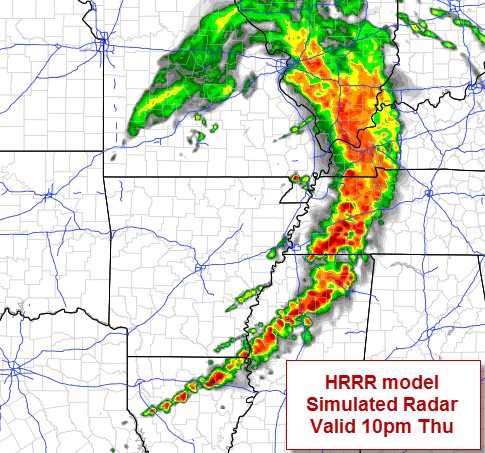 Below is a look at what one high-resolution model with a good track record (the HRRR) thinks radar will look like at 7pm and 10pm, or near the beginning and end of the event in Shelby County. NOTE: This is a MODEL, not a FORECAST and is intended to provide an idea of what will unfold. The first line of storms is fueled by the upper level disturbance, while the second line in central AR at 7pm is along the cold front. This model believes the second line falls apart as it nears the metro due to it moving into a "worked over" atmosphere that previously was stormy, as well as heating being on the decline. 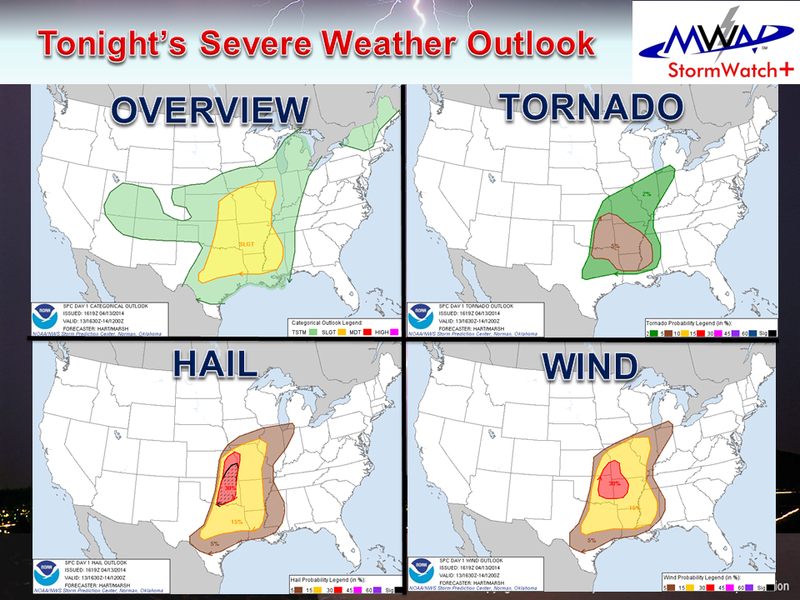 Finally, here is our MWN Significant Weather Outlook for today, highlighting the damaging wind threat this evening. In addition, the storms could be heavy rain producers, even though they will move through fairly quickly. Some minor flooding in urban areas could be possible behind heavy downpours. 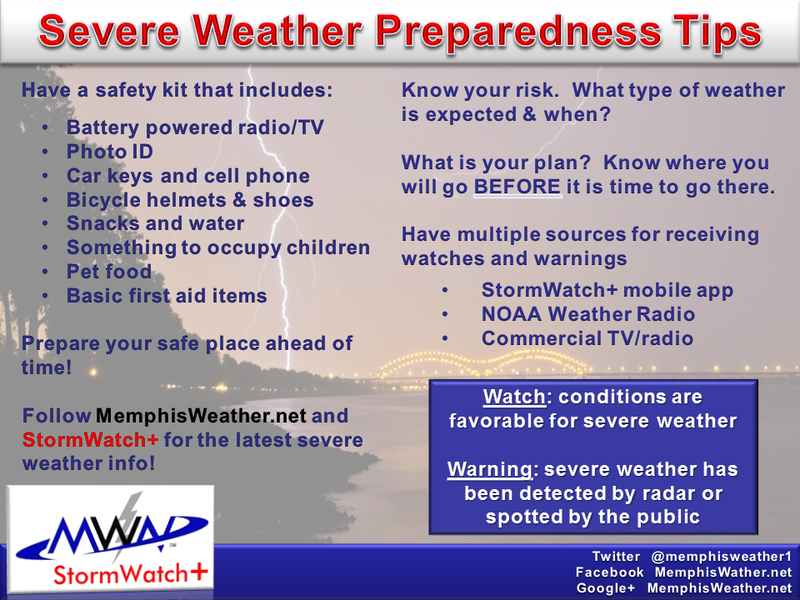 Now is the time to make your preparations for possible severe weather this evening. Know where you will be and what your safety plan is at that location - mainly where you will shelter if necessary. It's also necessary to know how you will get severe weather information. If you'll be away from home, get the MWN mobile app w/ StormView Radar and activate and setup StormWatch+ so that you will receive severe weather alerts no matter where you are. Download links are below. We'll provide the latest information and nowcast the storms as they move through via social media (Facebook, Twitter). A wonderful day is on tap today with sunny skies and warm temperatures. However, southerly winds look to make their return by tomorrow, which means that chances for thunderstorms return as well. Lets take a look at the details. 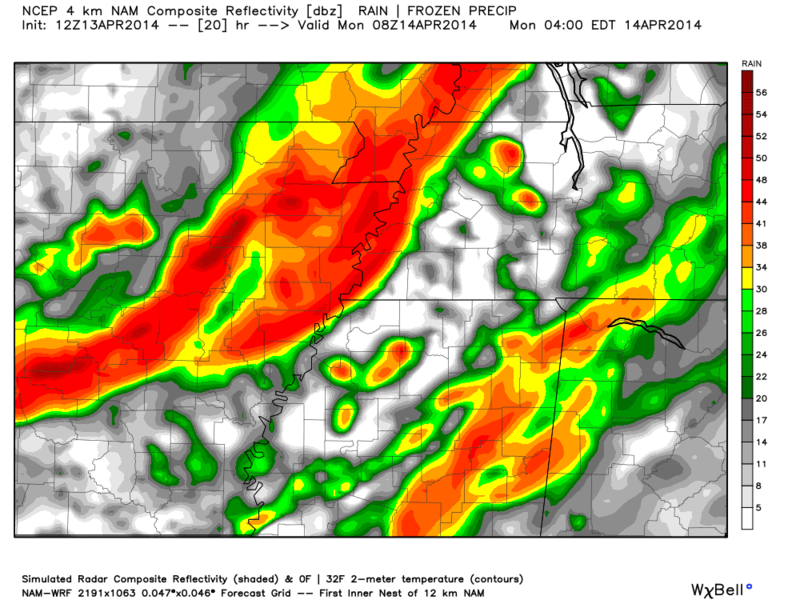 NAM model simulated radar at 7pm Thursday. In this scenario, an initial line of storms during the afternoon in AR has weakened as it moves across the river while another line is approaching the metro along the cold front. This is a MODEL interpretation, not an actual forecast. 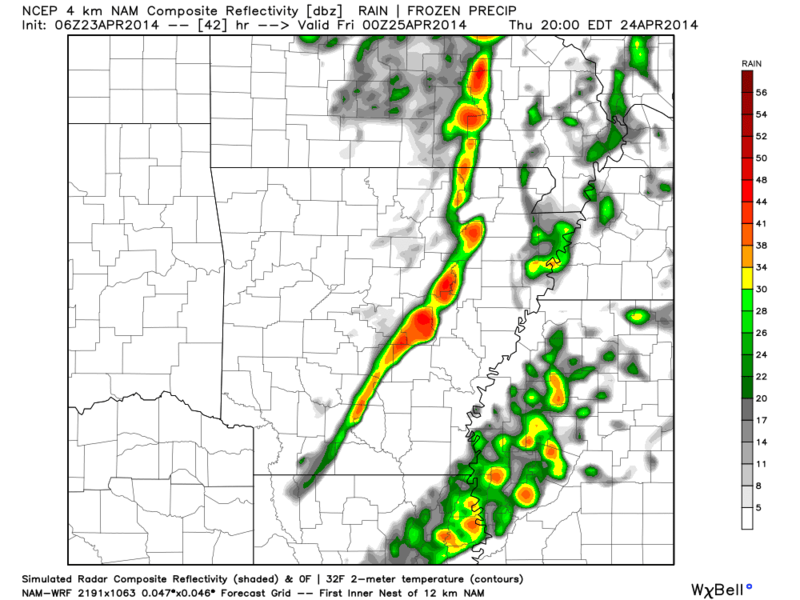 A simulated radar image from the 4-km NAM shows scattered showers and thunderstorms around the Memphis area by 7 PM Thursday with a line along a cold front to the west that would move through during the evening. I mention that southerly winds were the cause of this, lets take a look at the bigger picture. 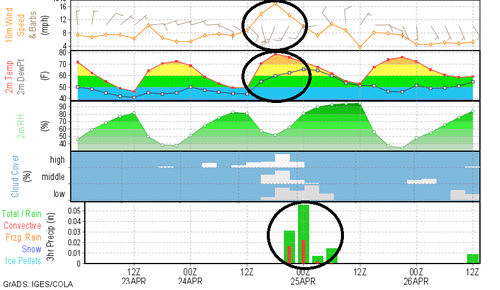 The NAM meteogram above shows exactly what I mean. Winds have shifted overnight to become easterly today. By tomorrow we see a wind shift to the south (top circled area) which results in increased temperatures, and perhaps more importantly dew points (measure of moisture), both shown in the second row. Both of these increase as a result of the warmer, moist air being transported from the Gulf of Mexico northward. This increase in heat will pave the way for scattered thunderstorms as an upper level disturbance approaches the area. The result is scattered showers and thunderstorms from late Thursday afternoon into the evening (forecast precipitation amounts in the bottom row). 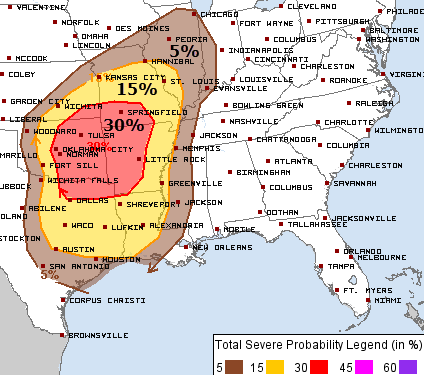 Probability of severe weather within 25 miles of a point on Thursday PM, per SPC. Due to the timing of the storms at peak heating on Thursday, a Slight Risk of severe weather exists across east AR, far western TN and northwest MS into northern LA. The probability of severe weather within 25 miles of the metro is 15% and the primary severe weather threat is strong to damaging wind and hail to 1". This severe weather probability is not high, but it is worth considering if you have outdoor plans between about 4-10pm Thursday. The chance of rain is about 50/50 currently, but any storms that form could be strong. GFS mid-level atmospheric height anomalies at mid-day Monday, showing a strong disturbance in the Plains moving east (greens/blues). A favorable area for severe weather is ahead of this disturbance. ...to a potentially more significant threat, we will see a rather significant trough to the west of the Mid-South by Monday. 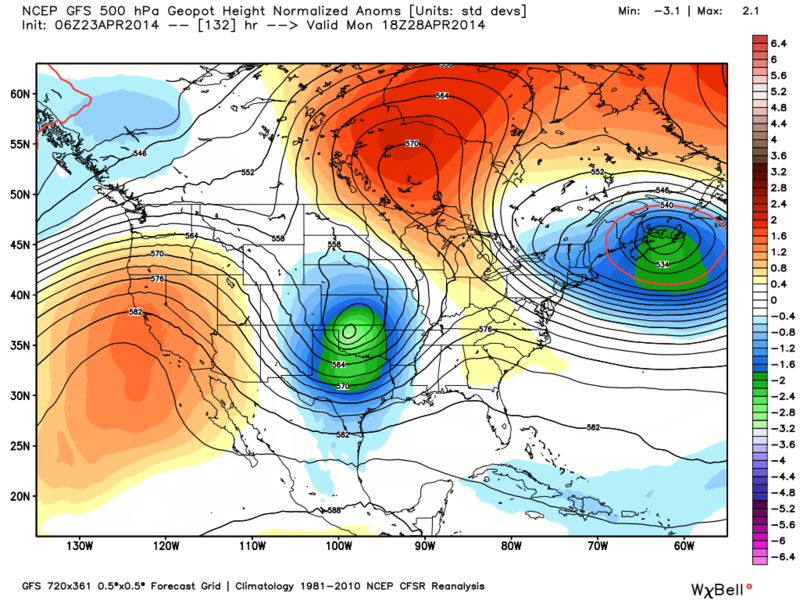 These large upper-level disturbances can create particularly nasty weather to their east. As a result, we are monitoring the potential for strong to severe storms heading into Monday. 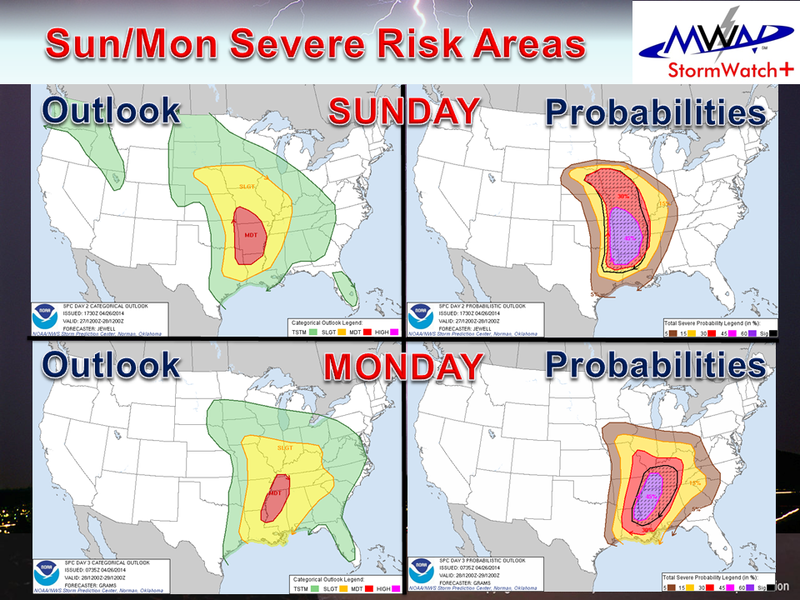 Right now we are anticipating storms starting Sunday (maybe late in the day) and continuing into Monday. We'll have updated information in future blogs and on our social media channels, but as of now all types of severe weather are possible, including tornadoes. 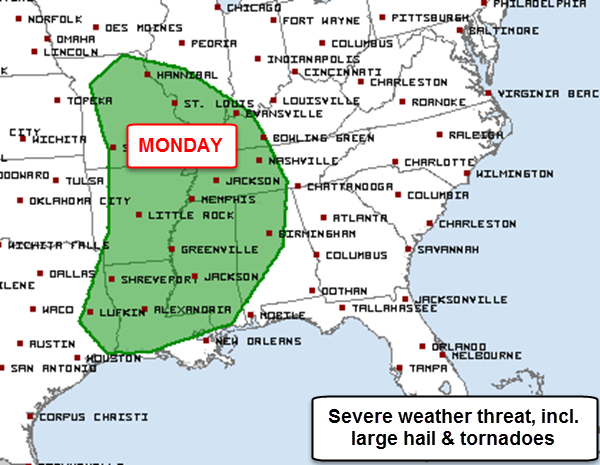 SPC is monitoring the area in green for severe weather on Monday. Make sure you have your severe weather plans in place as we get closer to these potential severe weather events and the climatological peak of severe weather season. We'll keep you updated on each event and provide complete coverage during the events on social media. A quick blog post on this fine Friday morning. Cold weather appears to be gone for the spring, though we expect some lows in the 40s to be possible over the next few weeks. Today we're on the backside of a strong Gulf low pressure system that is bringing rain to the southeast U.S. and storms to Florida, but I'll be surprised if we see a shower today. Scattered showers and thunderstorms will be kind enough to hold off until we head back to work Monday and it's possible it will be afternoon and evening before they arrive. We're watching for the prospects of strong storms but right now things don't look too bad. Showers and thunderstorms will move out by Tuesday morning it appears and the next system isn't due in until late in the week. Most of the week will be spent in the 70s to near 80 for highs and 50s for lows - pretty close to normal for mid/late April! Click here for the official MWN Forecast that takes us through next week. 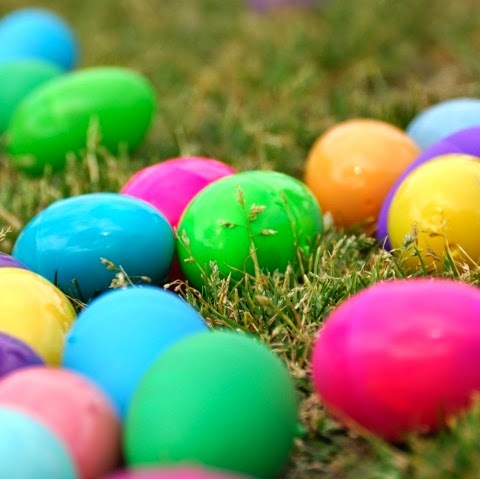 Happy Easter to all our followers, fans, and friends! 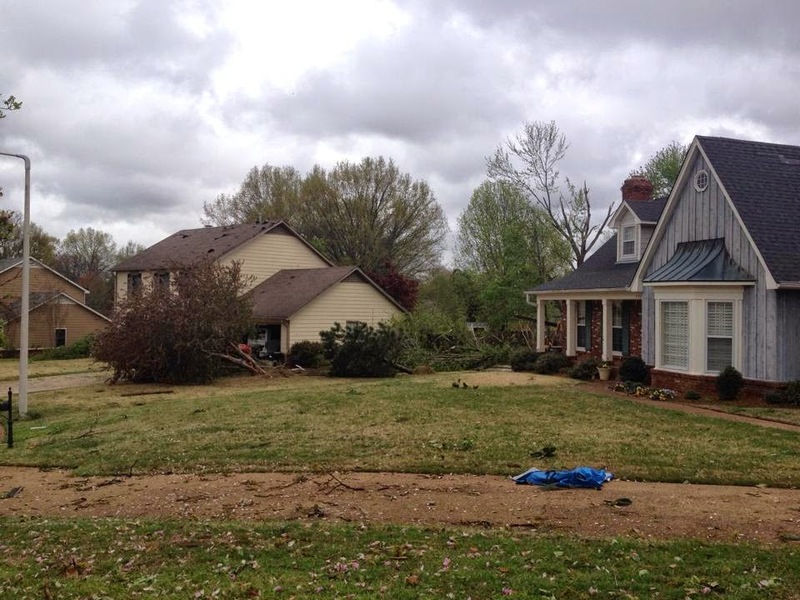 Strong straight-line thunderstorm wind, the result of a microburst, was the cause of damage observed in Collierville, TN from storms that moved across the area in the early morning hours on April 14, 2014, according to the National Weather Service in Memphis. The wind was estimated at 70 mph and affected roughly a half-mile path that was about 100 yards wide. Details from the NWS are below. 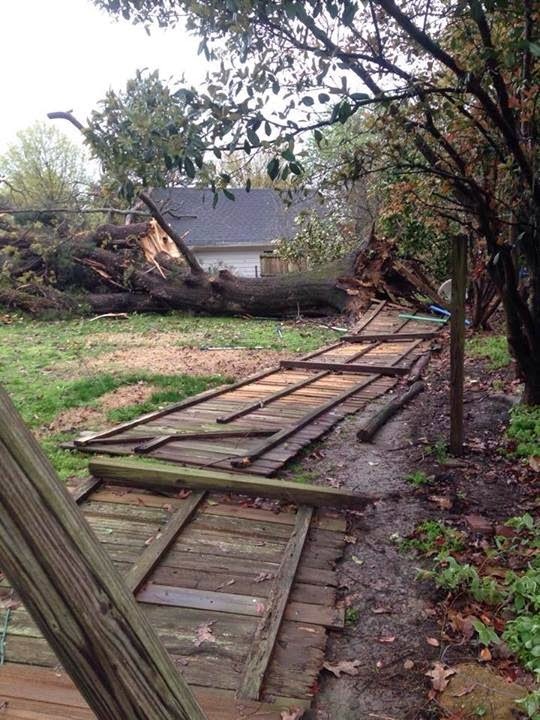 A MICROBURST OCCURRED IN COLLIERVILLE TENNESSEE. SEVERAL HOMES HAD MINOR ROOF DAMAGE AND FENCES WERE BLOWN DOWN. THERE WAS ALSO A NUMBER OF LARGE TREE LIMBS DOWN AND FALLEN TREES. NOTE: INFORMATION IN THIS STATEMENT IS PRELIMINARY AND SUBJECT TO CHANGE PENDING FINAL REVIEW OF THE EVENT AND PUBLICATION IN NWS STORM DATA. A microburst is a downdraft of cold air descending quickly from a collapsing thunderstorm and is a common phenomena with thunderstorms. The down-rushing air hits the ground and spreads out like a fan and can leave a great deal of destruction in it's wake. This is why we say to take precautions from Severe Thunderstorm Warnings similar to Tornado Warnings. The destroyed property doesn't care whether the wind was straight-line or rotating - objects can be lofted and blown about by either! Microbursts are perhaps best known for being significant hazards to low-flying aircraft, such as those on approach or departure from airports. Fortunately these days sophisticated detection systems are in place at all major airports that have resulted in no major accidents in a couple of decades. Multiple rounds of thunderstorms are expected overnight into Monday as a large-scale weather system moves through the region, ending the beautiful spring weather for a few days and replacing it with cooler temperatures - perhaps even some morning frost in some outlying areas. 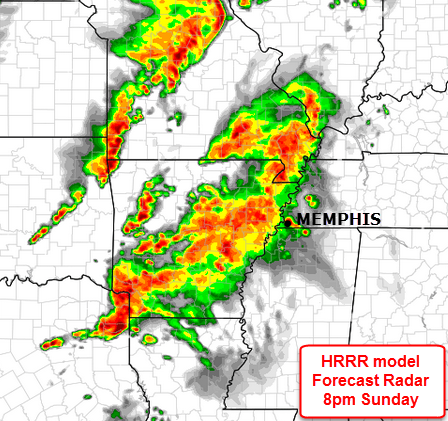 HRRR modeled radar at 8pm indicating an area of storms near the MS River. 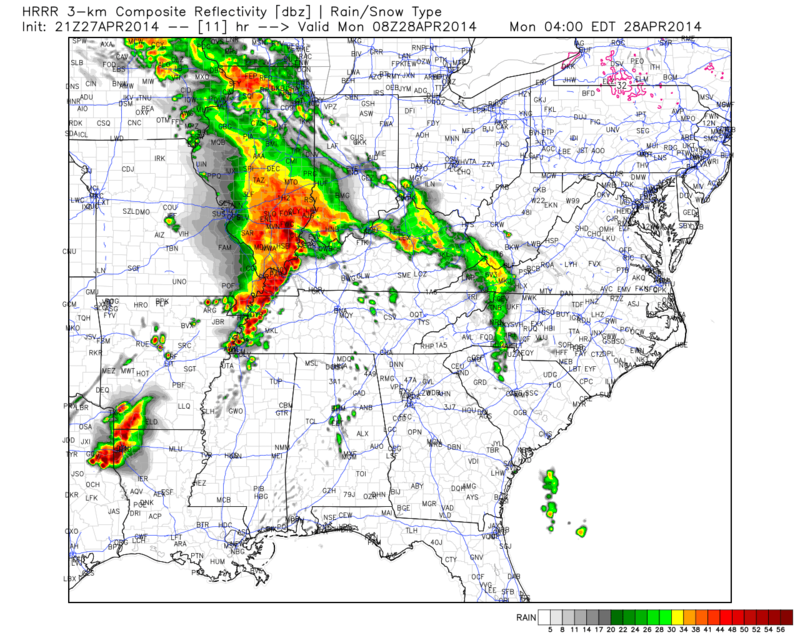 NAM modeled radar at 8pm CDT also indicating an area of storms along the river. Following the initial line of storms, another wave looks like it will move in during the early morning hours Monday. This area of rain and storms could also last a few hours, or perhaps until dawn. NAM modeled radar at 3am Monday indicating the first line of storms falling apart over northeast MS and another line over the metro. Behind the overnight storms, the cold front remains to our west, allowing more warm and unstable air to move back in as the front arrives in the early afternoon. A respite from storms is expected during the morning, though showers are still likely. Finally, as the front moves through, more showers and thunderstorms are expected to fire up mainly along and east of the Mississippi River during the afternoon hours, providing additional rainfall. NAM modeled radar at 3pm Monday indicating scattered showers and some thunderstorms re-developing over the area as the front moves through. All rain should come to an end during the evening hours Monday as the front finally moves well to our east. As far as severe weather is considered, the setup is fairly "messy" with a lot of thunderstorms but nothing overly impressive as far as severe activity. However, strong wind is possible with any of these lines of storms. Tonight's severe weather outlook from SPC (below) puts the metro in a Slight Risk zone with a 15% chance of 60 mph wind within 25 miles of the city, a 5% risk of large hail, and a 2% risk of a tornado. As for tomorrow, storms could again get strong to severe ahead of the front in the afternoon. The metro could see a few strong storms, but we expect most of the severe weather to be to our east where the atmosphere will be more potent as the front moves through later in the afternoon. Most severe weather should be just east of the metro on Monday, though a few strong storms are possible as the front moves through in the afternoon. As for flooding, multiple rounds of storms could drop a good deal of rainfall, though the ground is currently dry enough to handle a fair amount before flooding would occur. Heavy downpours in any line of storms could cause some short-term flash flooding concerns, especially in urbanized areas. Below is the predicted rainfall amounts from 7pm tonight through 7pm Tuesday. The metro is in an area that could see widespread 2" rainfall amounts with locally higher totals (perhaps up to 4" if multiple strong storms affect the same area). 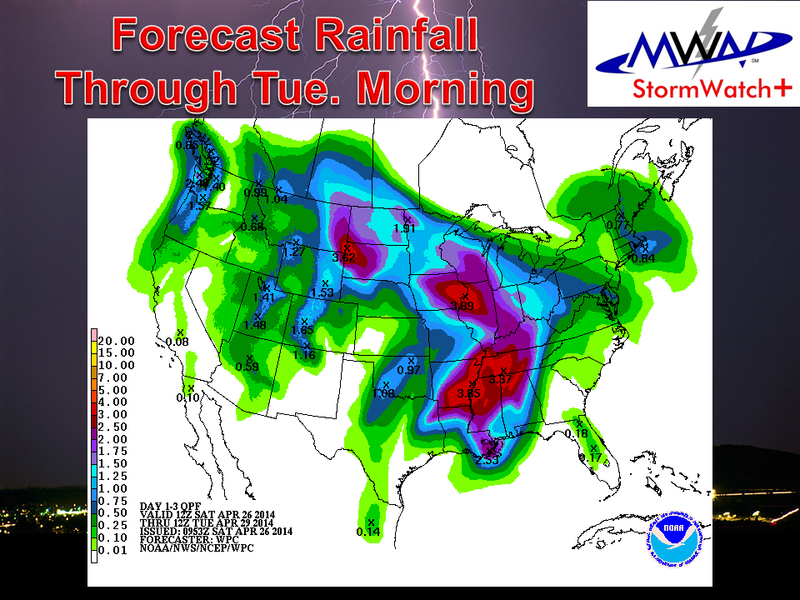 Projected rainfall totals through Tuesday. Widespread 2" totals are likely in the metro. MWN will provide as thorough of coverage as possible on our social media channels below for the next 36 hours. Our mobile app always has the latest radar, watches/warnings, and current and forecast conditions. Be sure to activate StormWatch+ severe weather alerts to warn you if you are in the path of a severe storm! 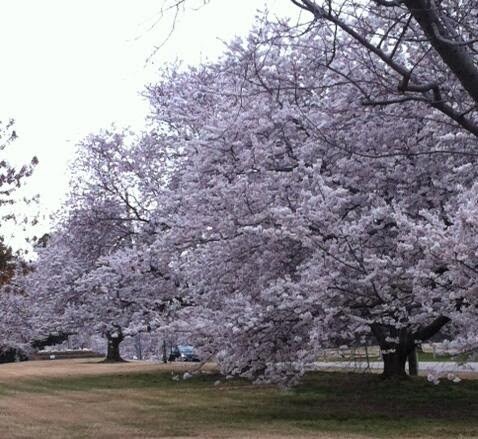 Yoshino cherry blossoms on Cherry Road, courtesy the Memphis Botanic Garden staff. Pleasant spring weather will continue into the weekend with temperatures well into the 70s (perhaps a few 80 degree readings) and gusty southerly wind to 25-30 mph. That southerly wind is increasing moisture and humidity levels. We'll see evidence of that this weekend with clouds moving in overnight and lasting into the morning hours, then breaking up in the afternoon resulting in partly sunny skies. Those clouds and steady wind will keep overnight lows in the 60s for the entire area as well. The next big weather system is a springtime front that moves through early Monday. Ahead of it, the increasing moisture levels and some instability will result in showers and thunderstorms affecting the area starting Sunday evening and continuing overnight. Severe weather is questionable at this time in the metro due to the atmosphere becoming more stable overnight Sunday night when the front arrives. However areas west of the Mississippi River could see the potential for strong to severe storms Sunday afternoon and evening as shown in the Storm Prediction Center Day 3 severe weather outlook graphic below. Probability of severe weather within 25 miles of a point Sunday-Sunday night, according to SPC. The main risk zone will be west of the Mississippi River. Behind the front, it appears showers will linger through a good part of Monday as low pressure moves along the front, which will be to our east, effectively stalling the front and sending moisture over the front and into the Mid-South in an overrunning pattern. Though it won't be cold Monday morning as temps remain above 60, the mercury could start falling Monday afternoon as the front pulls away, dropping temps through the 50s on a steady north to northeast wind. Projected rainfall totals from Sunday night through Monday. The Mid-South is likely to see well over an inch of rain, with locally higher amounts. Clouds finally depart Tuesday with cool conditions expected at least through the middle of the week. Highs may remain in the 50s Tuesday and Wednesday with lows dropping below 40 in some colder outlying areas on Wednesday morning. Another warm-up appears in store as we head into next weekend however. Just another spring-like roller coaster weather week in the Mid-South! 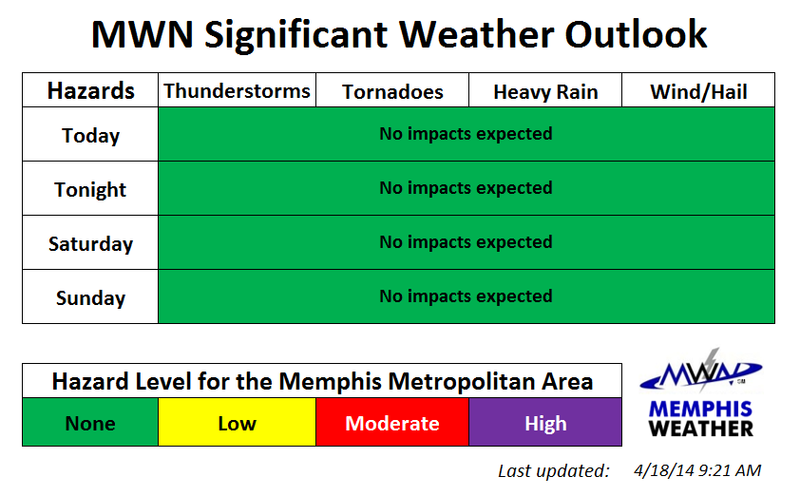 Click here for the complete MWN Forecast. 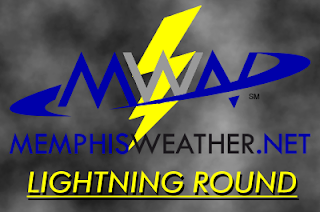 MWN Lightning Round: Tornado Look-Alike, Hail Potential Tomorrow, and the River's Risin'! Lets start another edition of the MWN Lightning Round off with an image that went viral over the weekend from a Double-A baseball game in McKinney, Texas. As you can see from the title of this section, this is indeed NOT a tornado, despite the headlines and captions on the internet. However, the picture is rather deceiving as it has been taken from a location and at such an angle that you can easily mistake the cloud to be that of a funnel. It is always important to pay close attention to what you are sharing on the internet. Severe weather is no exception to this rule. What you are actually looking at is a shelf cloud from a thunderstorm that is oriented in such a way that at first glace appears to be a tornado, however the cloud is not actually lowering to the ground. This thunderstorm could have very well still been dangerous, but it is important to know what you are looking at! Perhaps you've already heard via our forecast that scattered showers and thunderstorms are likely tomorrow, mainly in the afternoon. We'll briefly discuss why there is a chance of hail with some of the stronger storms. The above image shows very cold temperatures in the middle levels of the atmosphere tomorrow afternoon (15-20 below zero F) associated with a long wave trough. This combined with marginally unstable air at the surface will allow any thunderstorm that is able to grow to a modest height the ability to produce sub-severe hail (less than 1 inch in diameter). In addition, gusty wind and lightning will be likely from any storms. The most likely time for thunderstorms will be in the afternoon hours, though showers could start popping up by mid-morning. All activity will taper off quickly as the sun sets, causing instability to weaken. The last thing we would like to cover in this edition of the lightning round is the flood advisory that is in effect for all of our counties along the Mississippi River. 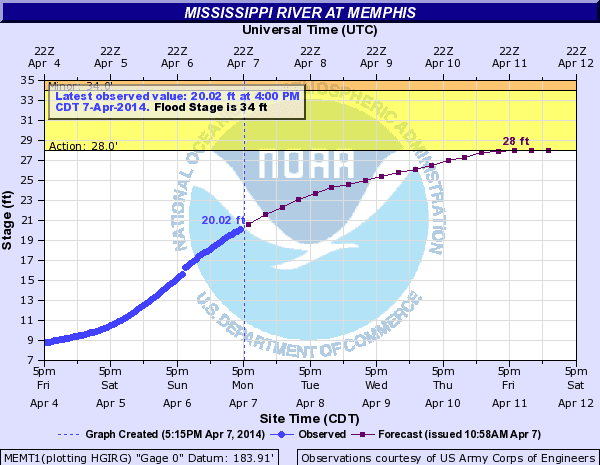 The image above shows the current level of the Mississippi River at Memphis at around 20 feet, with a forecast to rise to 28 feet by Friday, April 11th - a rather dramatic rise of 8 feet in just 4 days! This level is considered the "Action Stage" when Dacus Lake Road under the I-55 bridge begins to flood, water is encroaching on the levee south of Blue Lake, and Island 40 Road begins to flood. The river is forecast to remain below Flood Stage of 34' though. It is also worth noting that the river level at Tunica will also rise some 10 feet by Saturday, reaching a level just short of Flood Stage. At the forecast level, Tunica casinos will be unaffected however. For a full list of impacts click here and scroll down to the "Flood Impacts and Photos" section.